I drove Sarah to the airport early Monday morning and figured I might as well explore some new neighborhoods while I was at it. 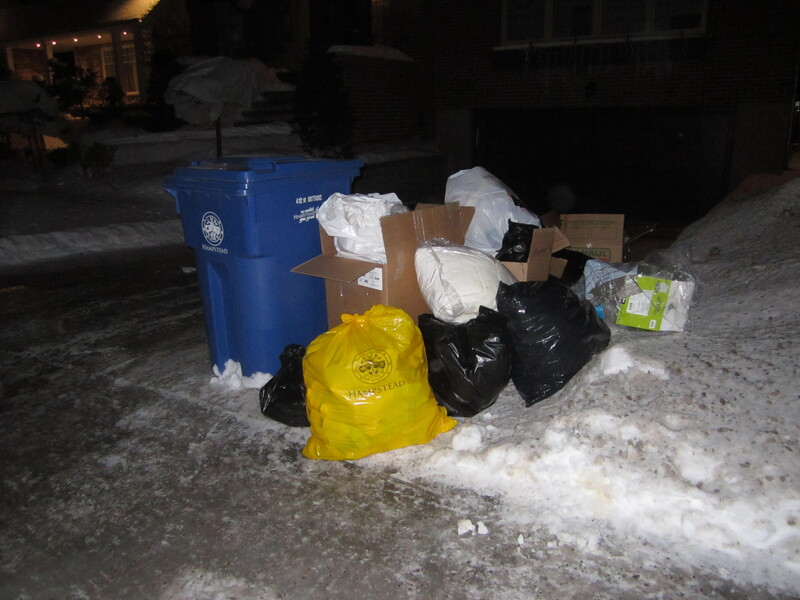 I didn’t have a plan going in, but remembered that Monday morning was garbage day in Pierrefonds east of St Jean Boulevard. It was a nice area, one that I might return to if I’m feeling adventurous or if circumstances encourage it. It’s too far away to cover regularly. This spot provided a few neat finds. It was pretty cold out, but having the car makes all but the worst weather pretty tolerable. Nothing compares to some of the bike trips I went on last year. 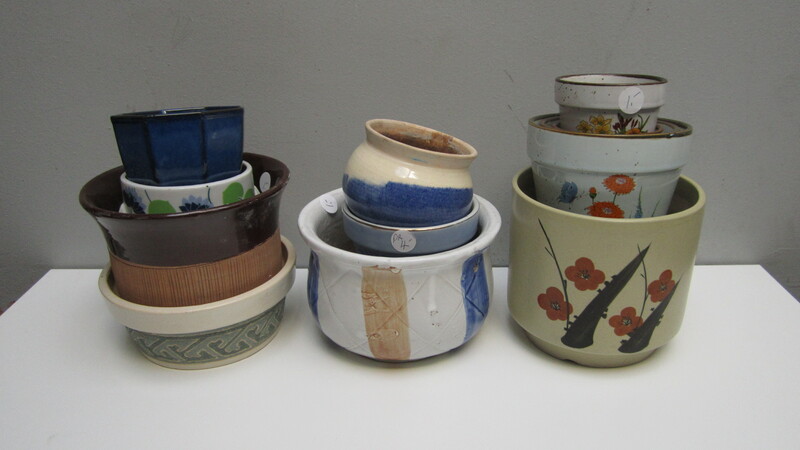 Inside the recycling bin was a collection of nice ceramic pots, many of which were vintage. Most had price tags on them, making me wonder if they were left behind from a yard or estate sale. 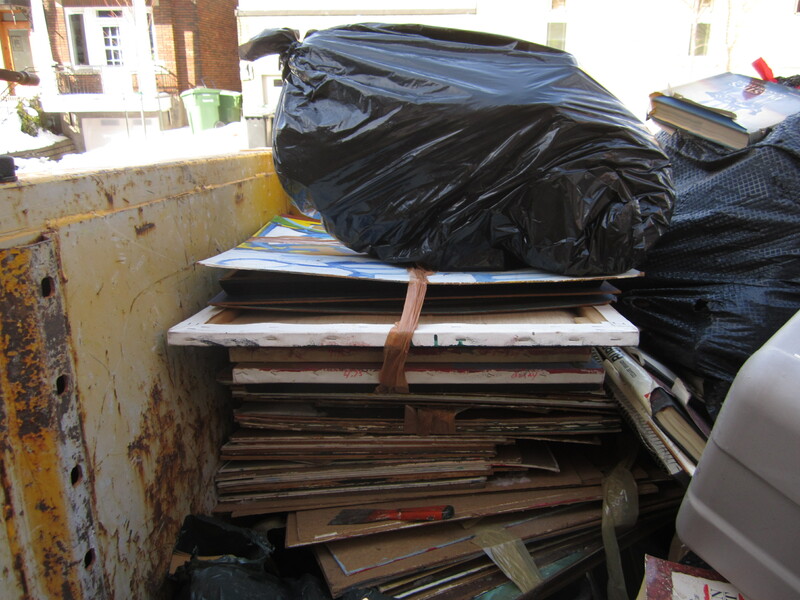 They were all in excellent condition, as if someone had gently placed them at the bottom of the bin. 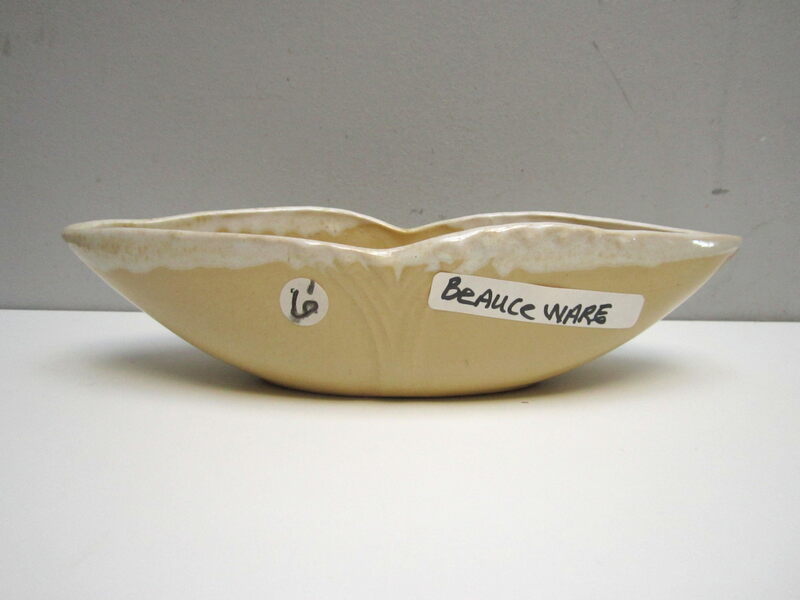 One was Beauceware (made by a company in Beauce, Quebec). 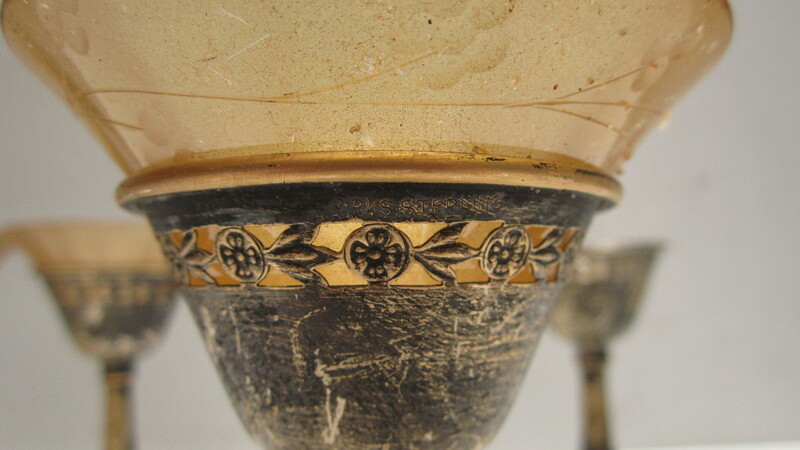 Pottery with this mark can be collectible, but only the more unusual designs are worth good money. 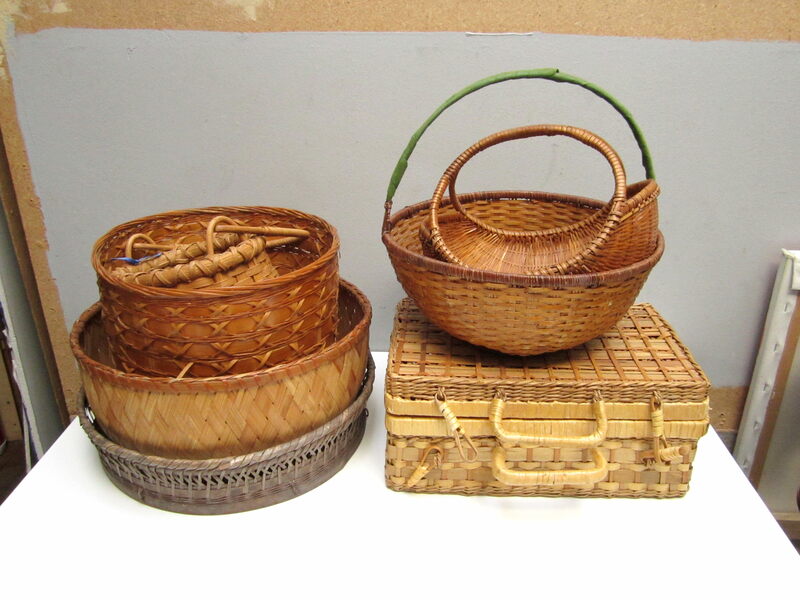 Also inside the bin was a collection of wicker baskets. 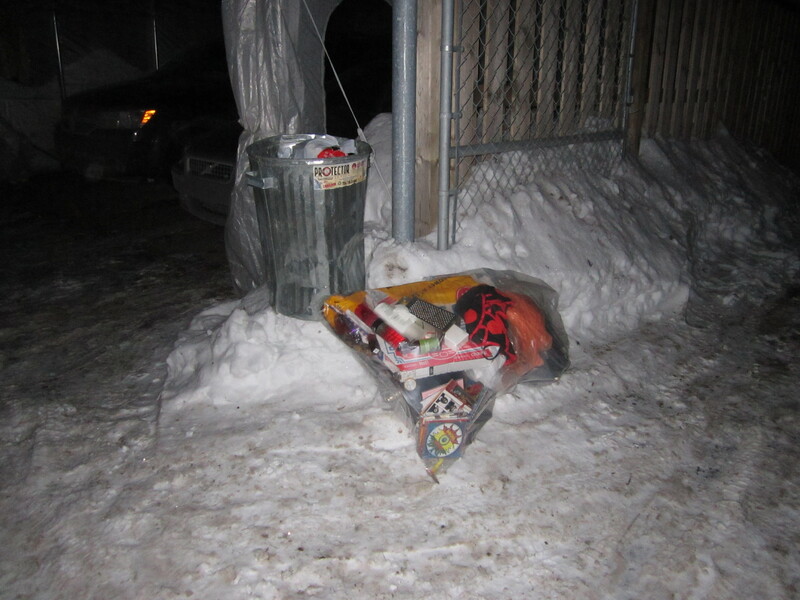 Outside the bin was mostly junk. There was a box full of old music books, but none were in good enough condition to be worth saving. I saved a hat, a small silver plate tray, and an Alfred Hitchcock book of horror stories. 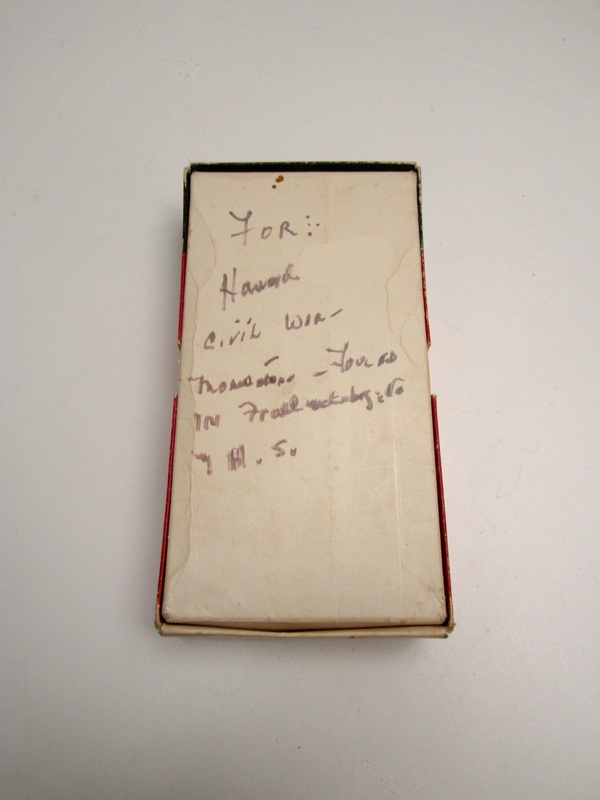 The neatest finds were hidden away in this old cheque box. 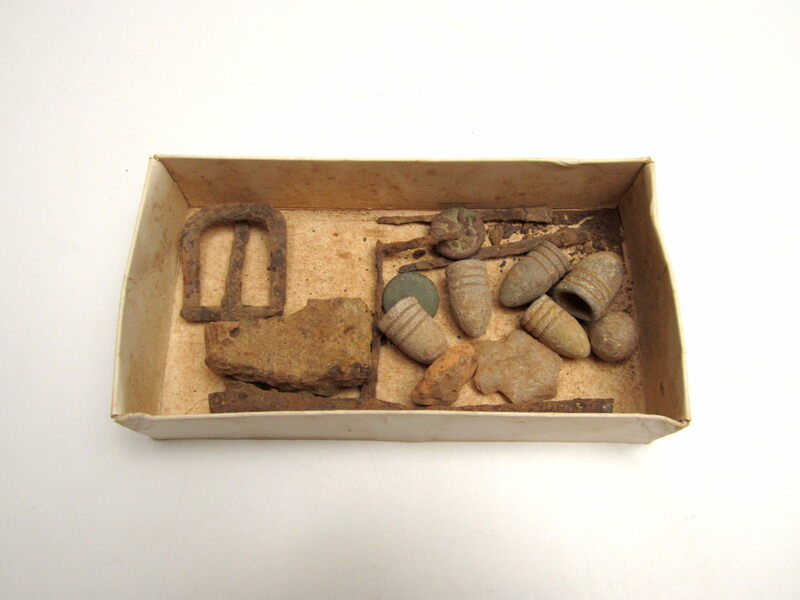 Inside the box, lying amongst some rust and dirt sediment were a couple buttons, a rusty old belt buckle, a few rusty nails and other unidentifiable objects, a piece of glass, and six different bullets. 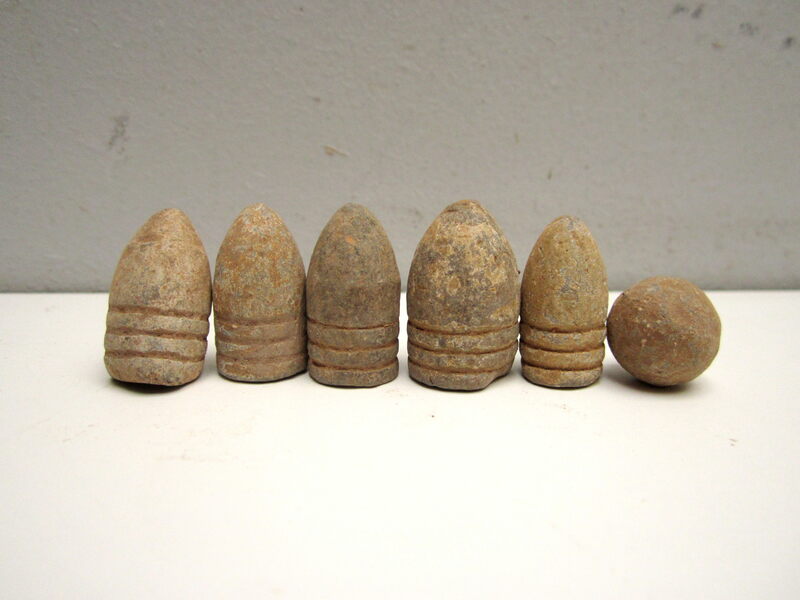 The message on the box made it obvious, but I actually have a bullet just like the ones on the left from my childhood – I was a big American civil war buff for a while. Some bullets are worth money, though I doubt these particular ones are worth a lot. They’re still pretty cool regardless, especially given that they’re around 150 years old! They’re made of lead and are quite heavy. 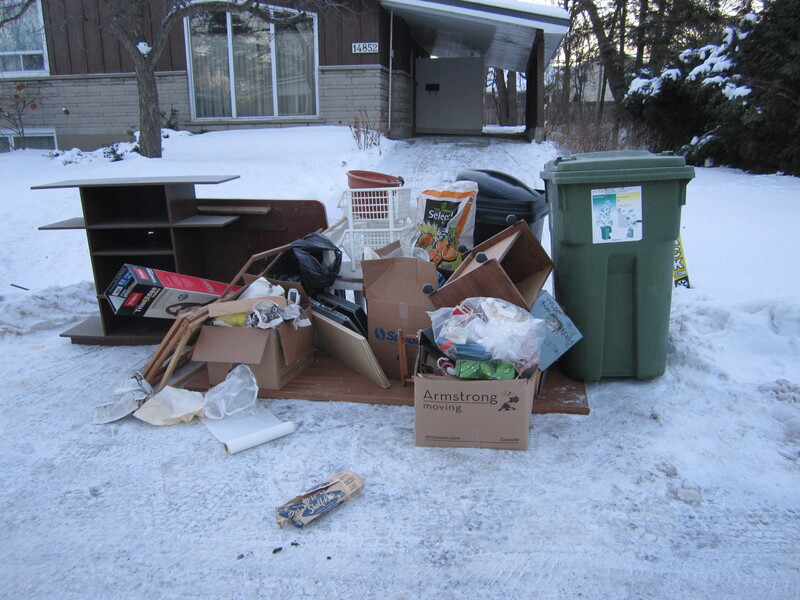 After a little more touring around in Pierrefonds, I decided to see check out Île Bizard to see if it was trash day there. It was, and I managed to find this nice little sewing chair. I had never been to Île Bizard before, so it was cool to see what it was like. On the way home, I found a Stanley Cup full of change (mostly pennies) in Ahuntsic, and some new re-writeable CDs in the Petite Patrie. Later that day, while walking to the post office I came across this bag in the alley next to Parc. 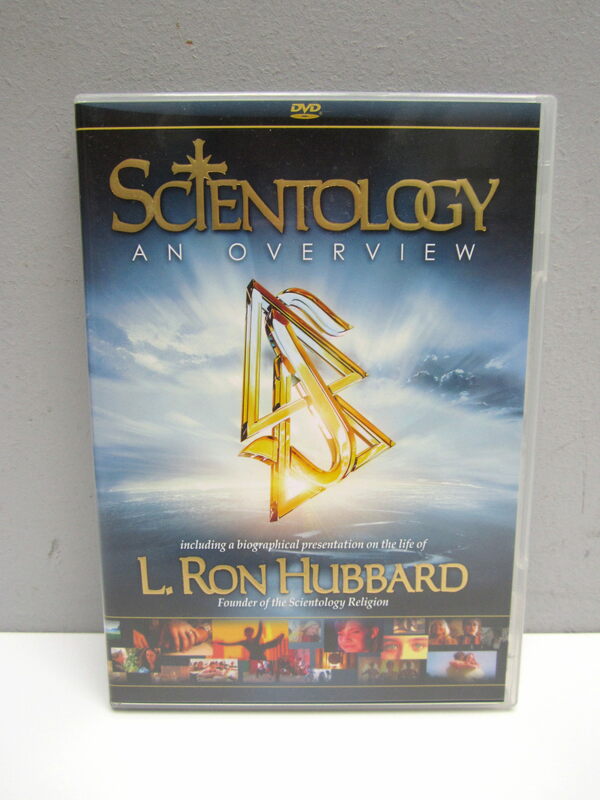 … and a DVD produced by Church of Scientology. Monday was a busy day. Later that night I went to Hampstead, hoping to avoid security while checking out the place I was evicted from the week prior. I came across this spot first. The pile sat in front of a large house for sale. Inside a couple of the bags was a large collection of gluten-free flours. Altogether there was over 25 pounds. Some of the flours were expired, but all the rice flour (18 pounds worth) was still within the best before date. 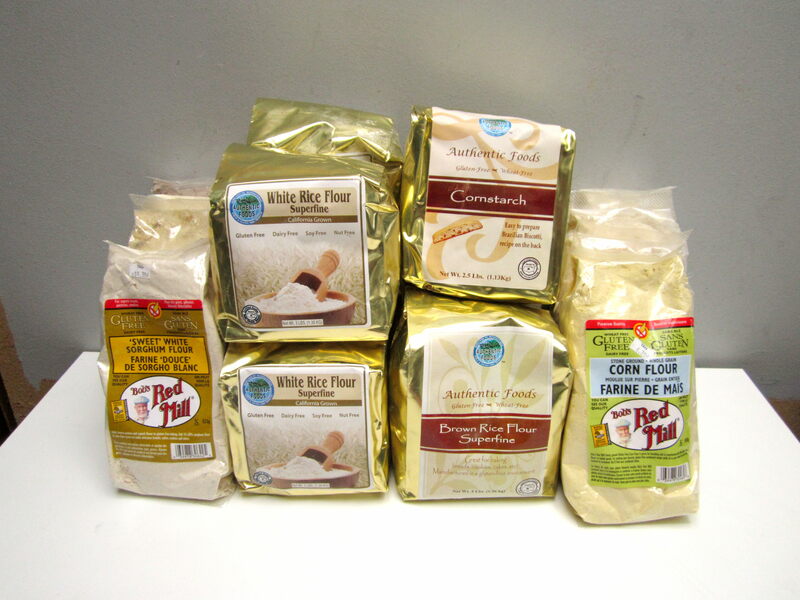 Gluten free flours are expensive, and the rice flour alone probably cost 60$ or more. Next stop was the pile I wasn’t able to explore the week prior. Again, there were a bunch of fabrics and old perfumes. 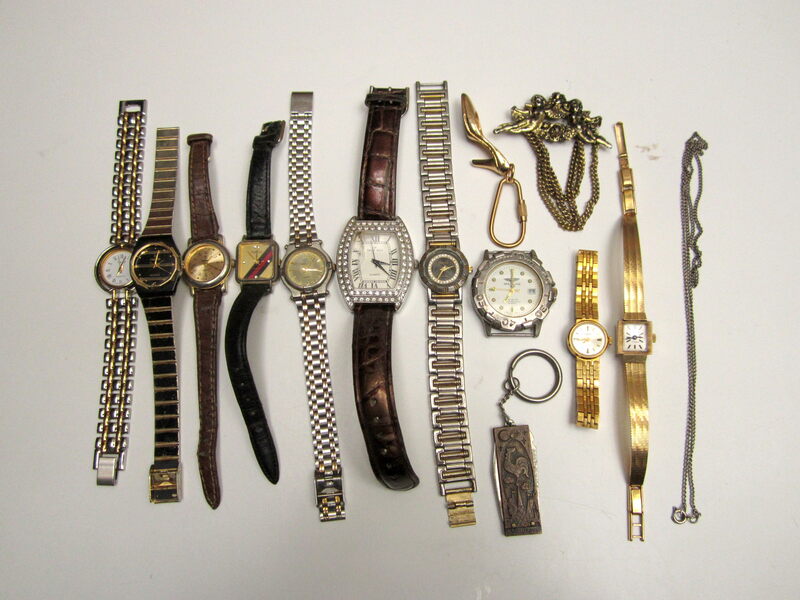 Another bag contained a bunch of boring old papers, and several different watches. The chain on the right is sterling silver. I was excited to find these, but most turned out to be junky, worn-out knockoffs. 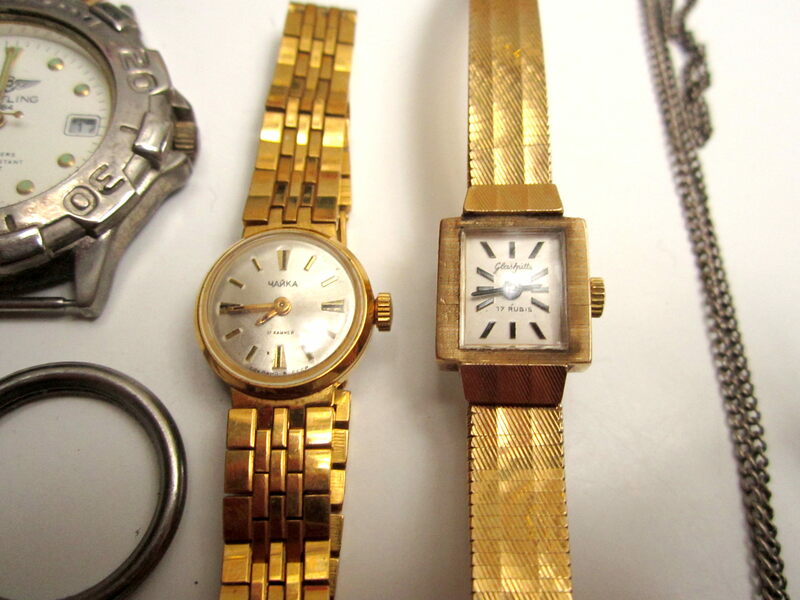 These two, a vintage soviet and Glashutte watch, were the nicest of the bunch. Both are plated gold, and surprisingly don’t look too worn. Unfortunately the mechanical movements don’t work, but they might be worth a bit for parts or repair, especially the Glashutte. 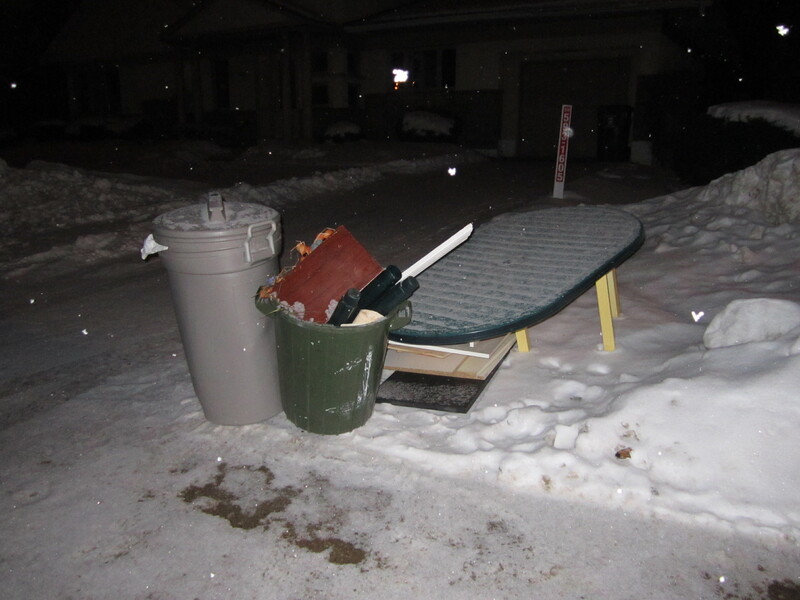 My sister tipped me off to a pile of trash in front of her place in Verdun Tuesday evening, so I decided to drop by for a visit and a look-see. Most of the stuff was junky and smelled heavily of cigarette smoke, but I did find a cool sterling silver horse ring and a trinket box in the form of a bird. After the visit I explored Verdun’s Wednesday trash day. I hadn’t covered it previously, and while I didn’t find anything it was good to get a feel of the lay of the land. Feeling energetic (and motivated to sleep in the next morning) I headed off to Mount Royal, another Wednesday morning pickup. I was surprised to see some garbage in front of this house. I haven’t seen anything here since July, when I helped the homeowners and a vintage store owner move some furniture into a van. The house recently sold (which I know because of the sign out front), so perhaps that was the impetus to finish clearing out the house. In the past, this spot consistently produced a small amount of neat stuff each week. This time was no different. 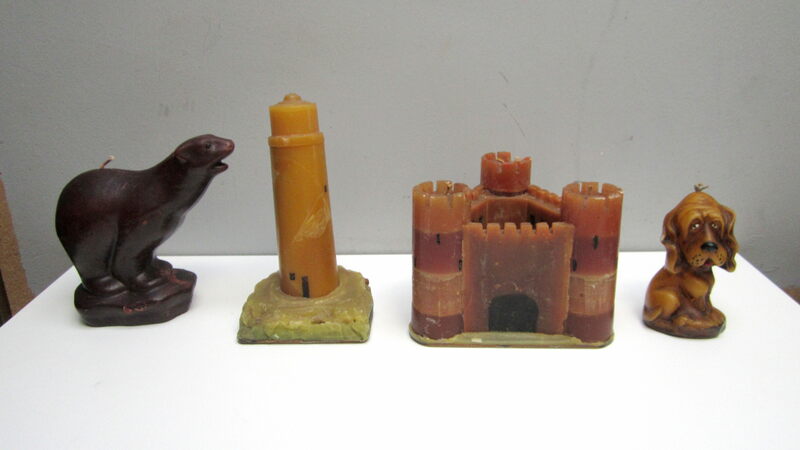 I thought these hand-made candles were pretty cool, to the point where you wouldn’t want to actually use them. My personal favourite is the seal. The dog (and likely the others) were made by a H.B. Candles in Lachute, Quebec. I’ve been reading a book about the Montreal Expos baseball team, and because of this have been hoping to find some cool Expos-related stuff, especially old audio recordings or video footage. You never know, right? I was hoping “bgame” meant “baseball game” or “ballgame,” but that’s probably a bit far fetched. 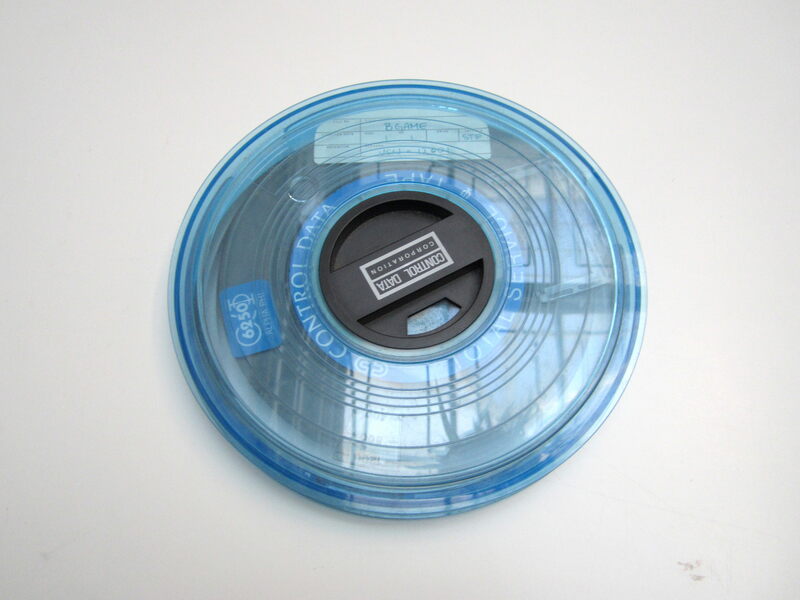 I thought it was an audio reel at first, but it might actually be an old-school data storage reel for the computer. 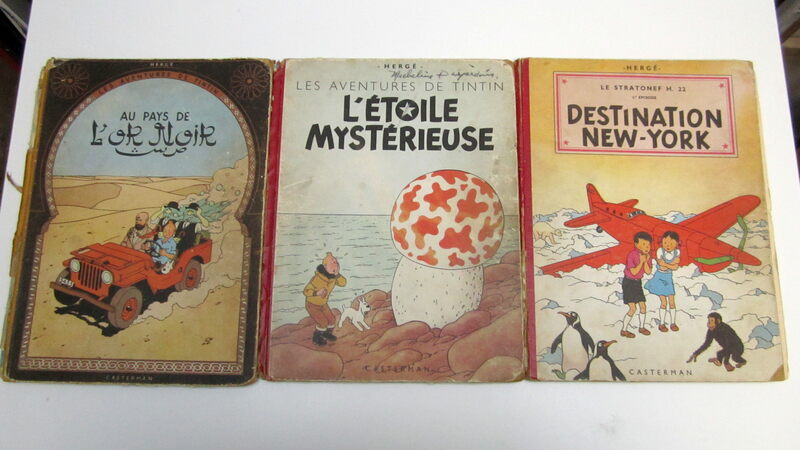 … came some old books, most notably editions of Tintin published in the late 40s / early 50s. There seems to be a bit of a market for these, and I should be able to make some money of them despite their well-used condition. 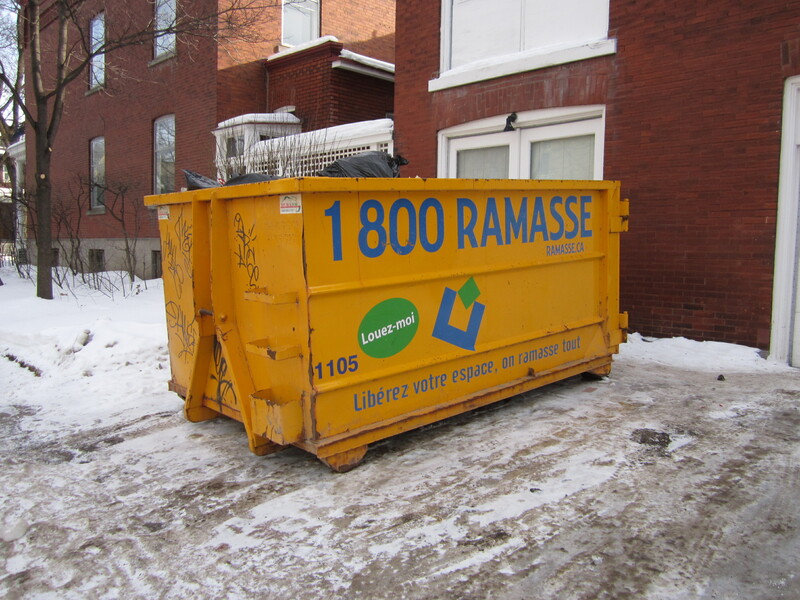 Thursday morning was looking like a bust before coming to this dumpster in Outremont. These large containers are most often filled with renovation debris, but this one looked different, even from a distance. I opened the door and saw bags and bags of stuff. It seemed that someone was clearing out a house. In the back were lots of old paintings on canvas and boards. They actually took up a good chunk of the dumpster. 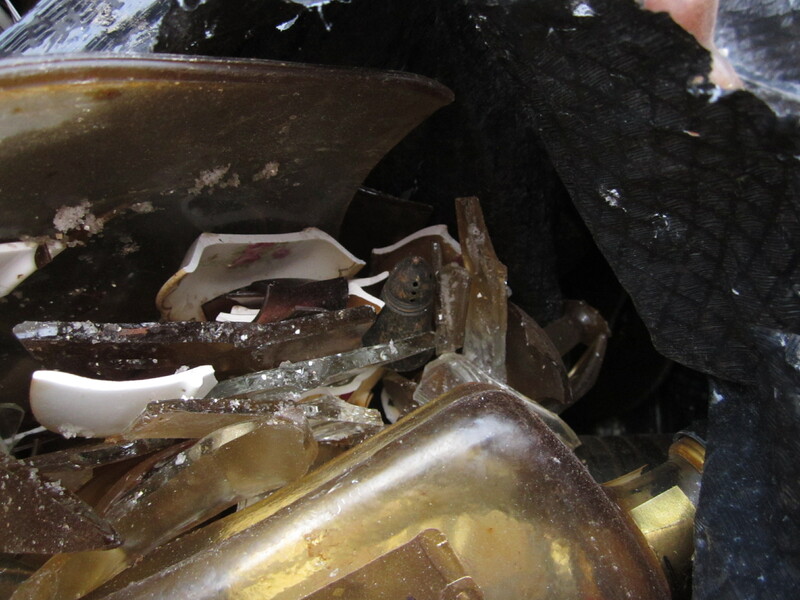 Many of the bags were full of old glass and ceramic. Nearly everything was broken or even pulverized. Most times people take care not to break things even when they’re putting them out to the curb to be destroyed (mainly to ensure the safety of the garbage collectors), but I guess having a dumpster makes that less of an issue. Metals were mostly safe from damage, though – you can see one of my finds at the middle of this shot. Still, all the kitchenware was pretty grimy, as if they had been sitting in the counters unused for many years (with some added cigarette smoke for seasoning). I was able to save a bunch of good stuff. 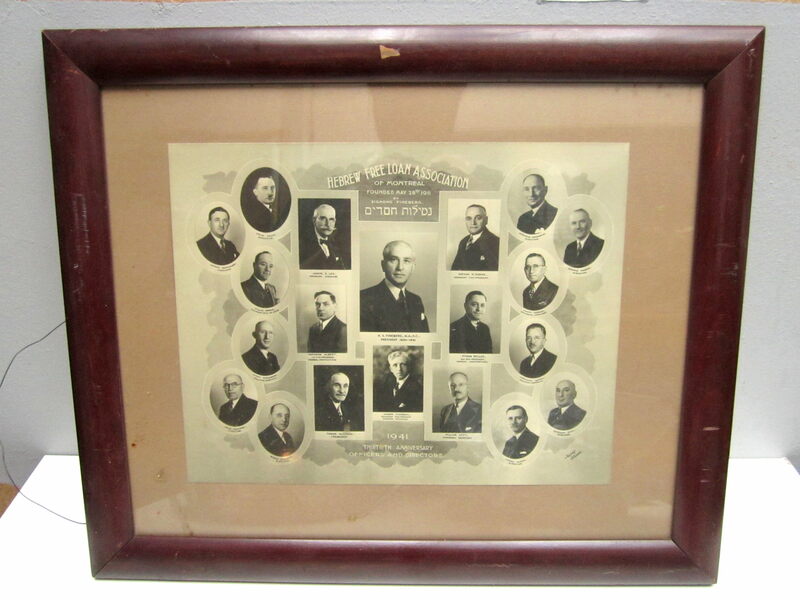 Here’s a framed print featuring the organizers of the Montreal Free Loan Association, as it existed in 1941. This organization still exists today, and their focus is offering interest-free loans to those in need. 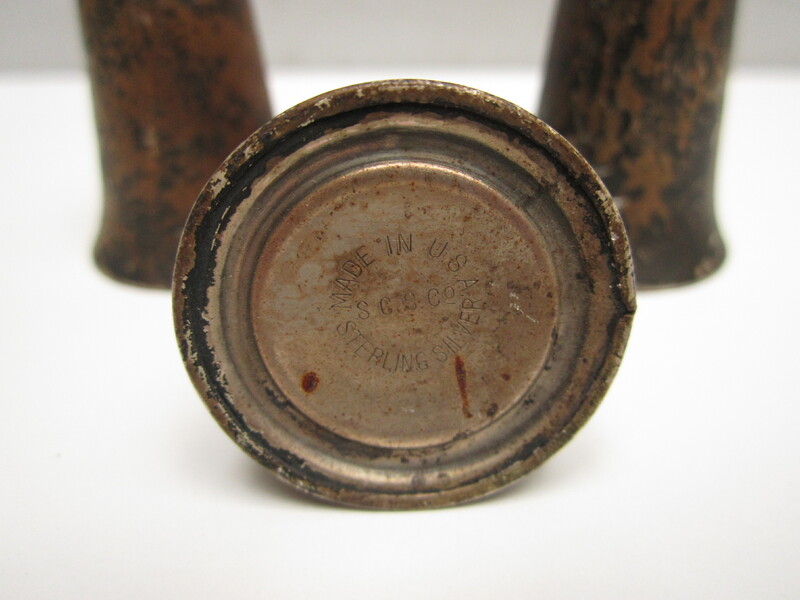 … and a Wagner Ware cast iron pot. It was a bit rusty when I found it, but elbow grease took the most of it off. I love fixing up old cast iron. 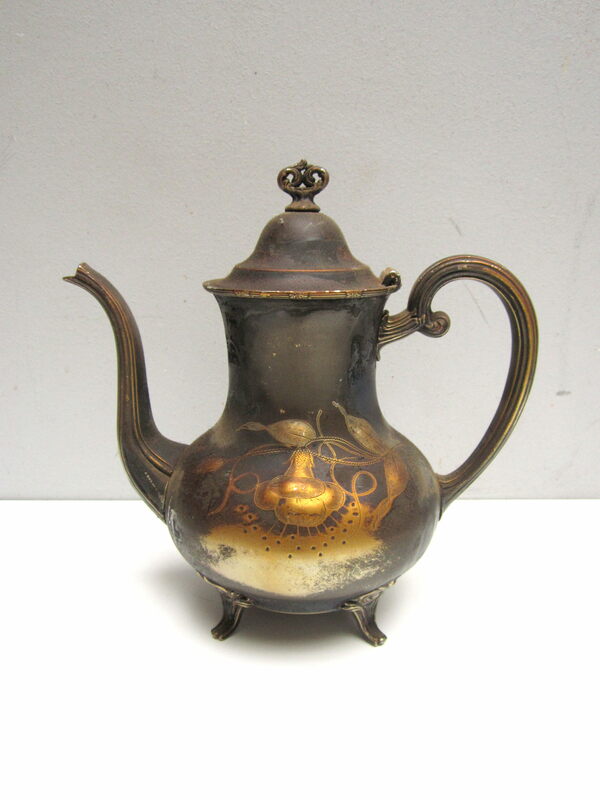 Vintage pieces sell for decent money, particularly when they’re seasoned and ready to go. It’s a shame these took such a beating. They’re just scrap silver in their current condition. 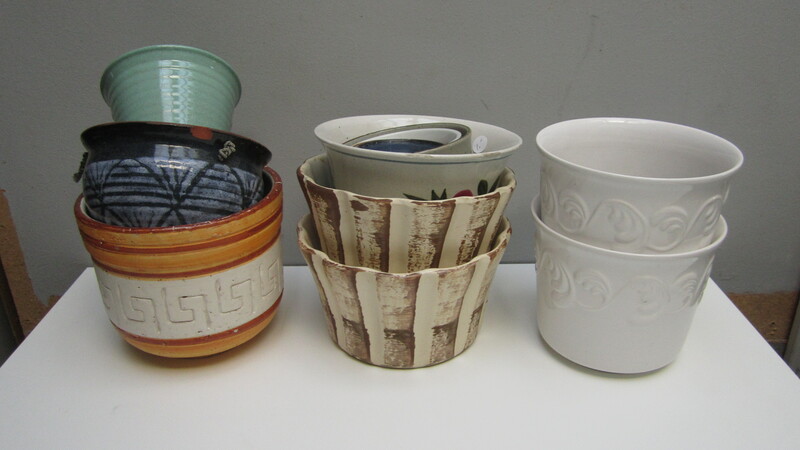 Each cup weighs about 30.5 grams, which adds up to about 75$ of scrap value. What I might do is keep the one monogrammed cup, and put the one nice glass piece on it. The glass is super grimy in the picture, but cleaned up nicely. Maybe I’ll post some before and afters at some point. 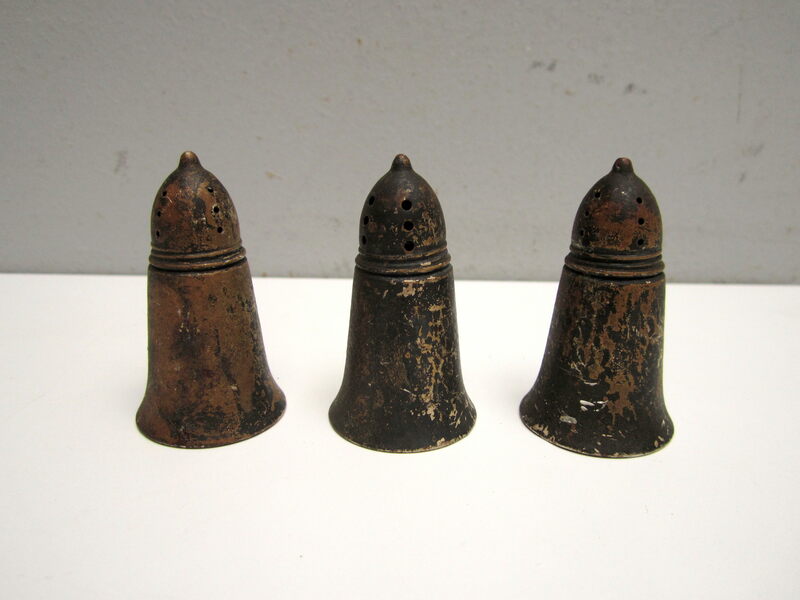 These little salt shakers (one of which you may have seen in the picture above) are sterling silver as well. They’re in decent shape, they just need a good cleaning. Still, I may end up just selling them for scrap. Altogether, they’re worth maybe 10$ in scrap value. This silver (quadruple!) plate footed teapot (made by F.B. Rogers) is actually in very good condition, outside of it being in desperate need to be cleaned. 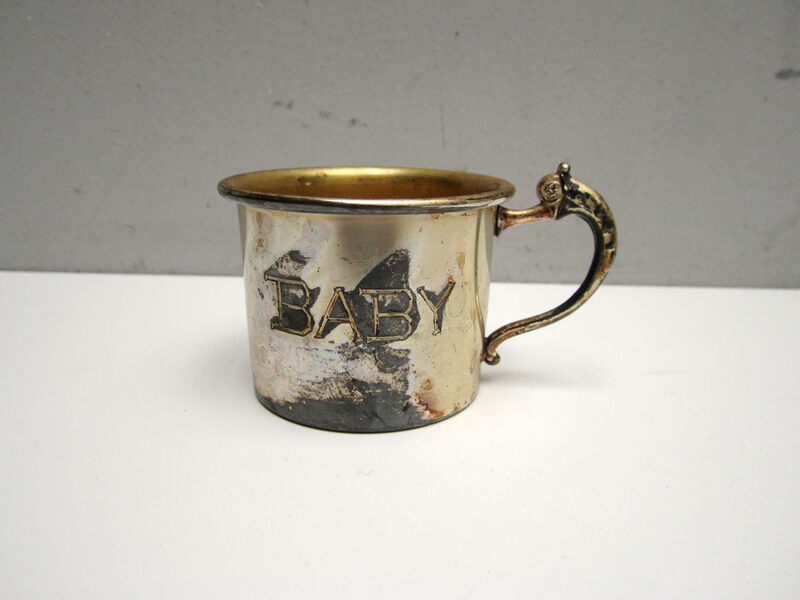 This little mug, monogrammed “BABY” was made by the same company. It’s a cute piece that should clean up nice. Near the front door of the bin were two necklaces with pendants. There’s a little ball inside the pendant. 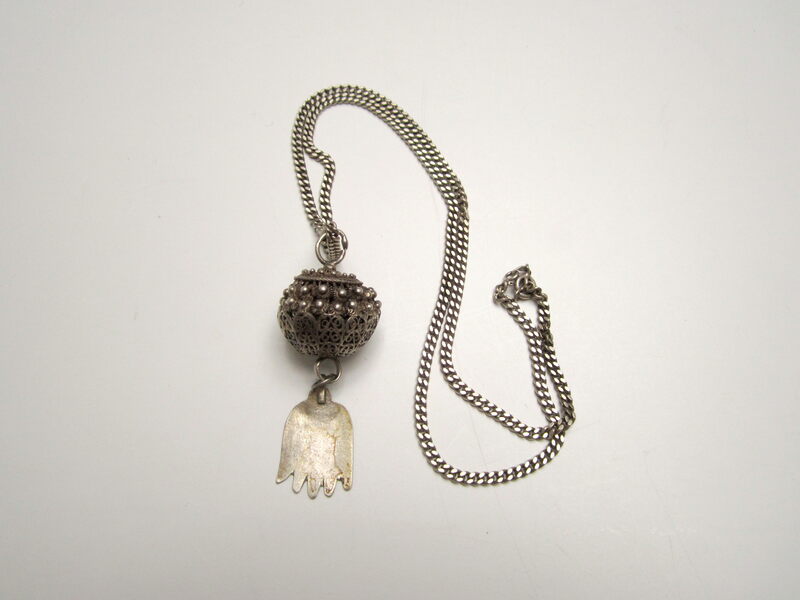 The pendant and chain are both sterling silver, but the little charm hanging from the bottom isn’t. That piece has a Hebrew (?) monogram. 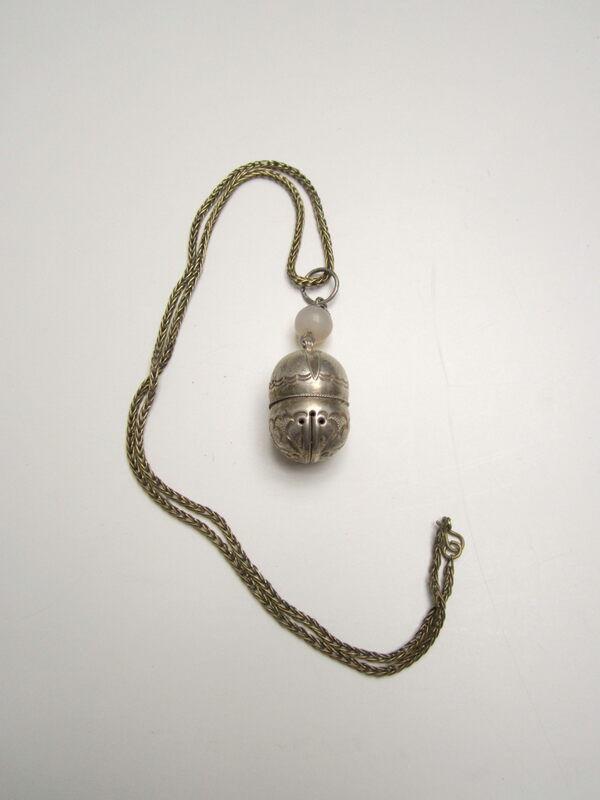 Here’s the other pendant, which (though unmarked) tests positive for silver. There’s also something inside this one. It sounds a bit more like a bell than the other. Does anyone know what these styles of pendant are called? It might help me sell them. They’re definitely quite old, and may have some value. Some interesting finds to be sure! I’ll be keeping an eye on that dumpster going forward. Lots of sales last week! As opposed to a few weeks ago when everything I sold was relatively expensive, most of my sales this week were for a smaller amounts. 1. 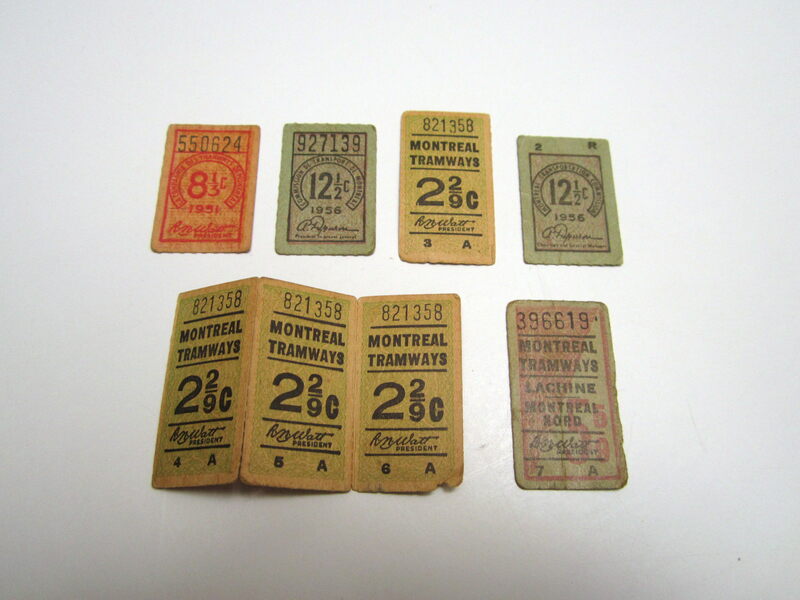 Vintage Montreal tram tickets, theatre program: To a reader for 30$. These are pretty cool, and I would have kept them myself if I were rich. I love old ephemera of this type. Found a few weeks back in Verdun. 2. Wilcox silver plate tray: On eBay for 6$. Sometimes things take a long time to sell, and I get really sick of seeing them sitting around. This is one of those items. I recently lowered the price by a substantial margin in hopes that would help it get out the door. I made 6$ profit on the transaction, but after eBay fees (it’s been listed for nearly a year and a half) I doubt I made anything at all. Just to be clear, the price I list here is my total profit – shipping costs have already been removed. 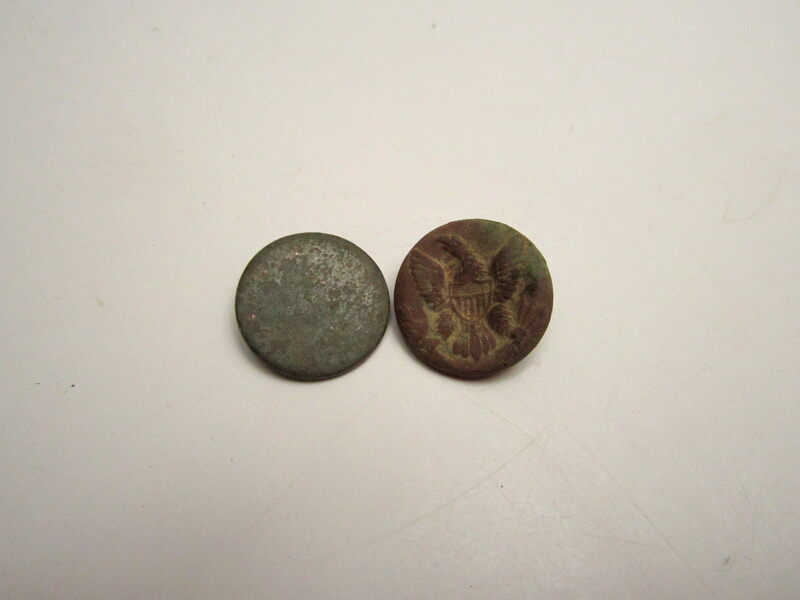 Found late June 2013 in the Plateau. 3. Aynsley bone china teacup and saucer: On eBay for 45$. Another one gone! Found early October in Ville St Laurent. 4. 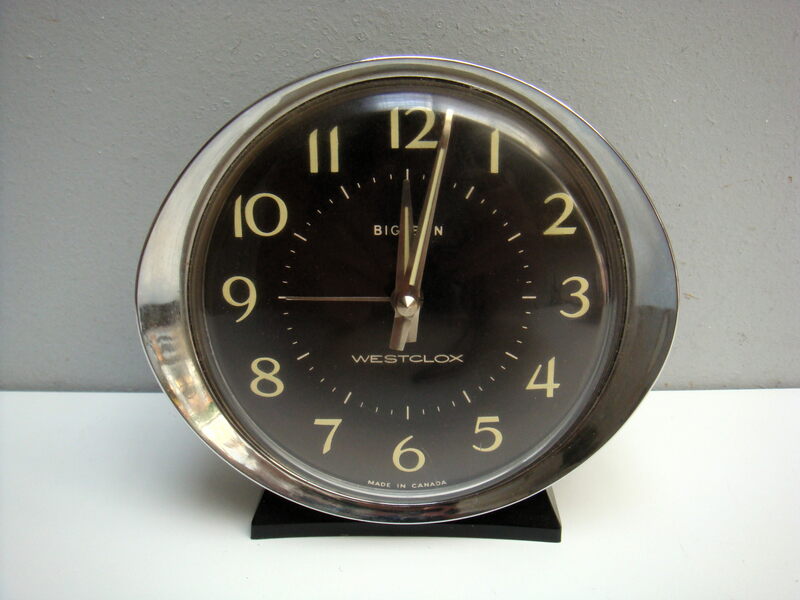 Vintage Westclox “Big Ben” alarm clock: On eBay for 30$. Found early October in the Golden Square Mile. 5. Lot of four 1970s Quebec license plates: On eBay for 15$. Found in the Snowdon area at some point early in the summer – I may have forgot to mention them. 6. 1958 Santa Barbara road races program: On eBay for 55$. I’m glad to see this go as well. Found September 2013 in Mount Royal. 7. 1978 Corvette owners manual: On eBay for 23$. I didn’t mention this on the blog, but I found it this fall in Mount Royal. 8. 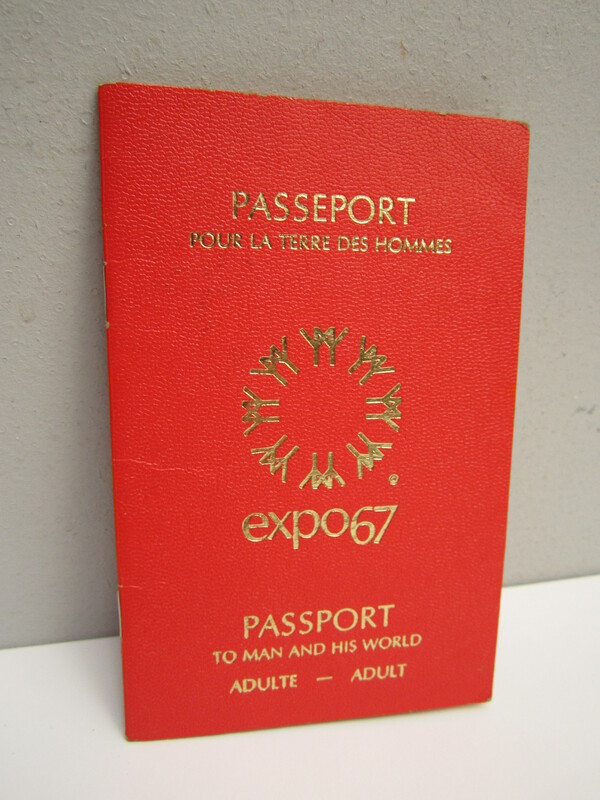 Expo 67 Passport: On Ebay for 40$. Found late October in Cote St Luc. (It was one of the ones photographed above). It was loaded with stamps. 9. “Le Nez du Cafe” coffee scents: On eBay for 25$. I actually found this in a box of free stuff left out after a yard sale, and never got around to mentioning it on the blog. Found this summer in the Plateau. 10. Lot of three vintage Pyrex refrigerator lids: On eBay for 32$. Found in the Plateau this summer, though also not recorded. 11. 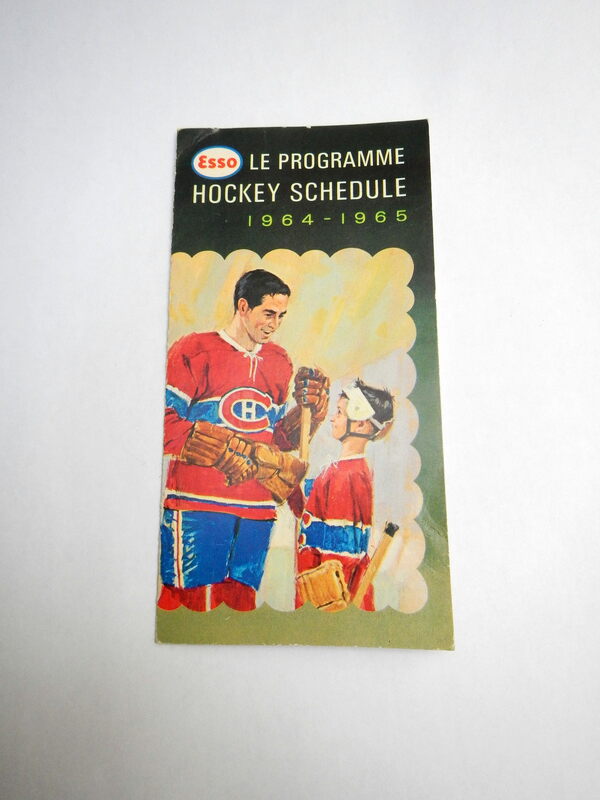 Esso 1964-1965 season NHL schedule: On eBay for 35$. Found early June in Snowdon. Total: 336$, 11463$ since May 18 2014 and 1780$ since the new year began. It was a good week, one that cleared out around 8% of my eBay stock. This week has started off pretty well too – I’m thinking that this cold January weather is keeping people inside (and on the computer). I just finished that Expos book and it was really quite fascinating; glad you’re enjoying it! Yeah, it was a good one. I miss the Expos, though at least I was able to switch to the Blue Jays. I was only a baseball fan starting in 2002, so transitioning was relatively easy for me. You’re right, thanks. I actually went to Gettysburg, back in the day. It’s not particularly close to Fredericksburg, but it does still end in burg. Interesting silver pendants. I look forward to seeing reader contribution to their identification. I hope you post pics of the shined-up silver and silver plate. Sandy B beat me to it on Fredericksburg, so I’ll just say how much I’m enjoying your posts. My wife and I are divesting ourselves of “stuff” (some of it, anyway), so your posts give me the fun of stuff without having to have it in the house. Thank you. 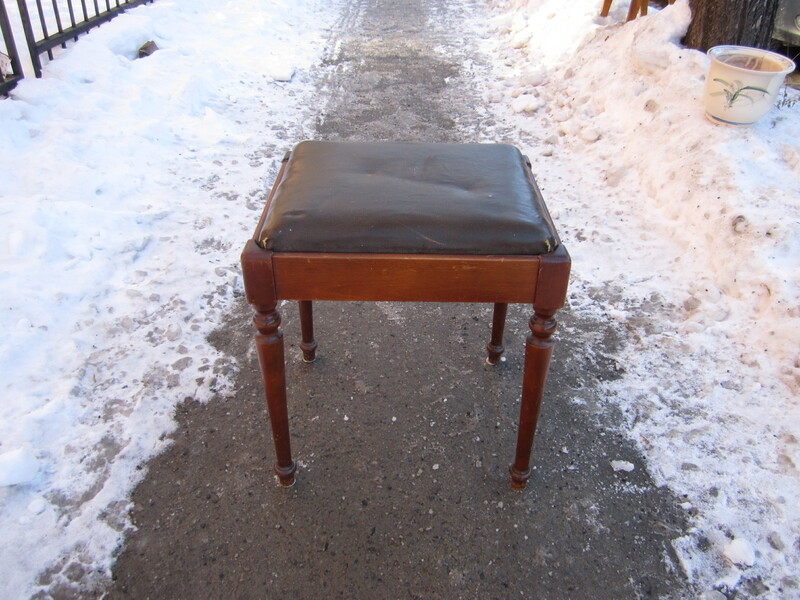 I already left it on the street for others to take (someone did). It had a few cracks on it so it wasn’t in perfect condition. I’ll keep you in mind in the future though. It makes me sad to think of some silver being melted down for scrap. If you’re selling the little salt shakers, I’d be interested, and possibly the glasses and any scrap silver coins. Matt Malone doesn’t mind being called a professional dumpster diver. He tells me this a little after 2 am on the morning of July 7 as we cruise the trash receptacles behind the stores of a shopping center just off the Capital of Texas Highway in Austin. Given the image that conjures, though, it’s worth pointing out that Malone has a pretty good day job, earning a six-figure salary as a security specialist for Slait Consulting. He is also founder of Assero Security, a startup that he says has recently been offered seed money by not one but two separate investors. 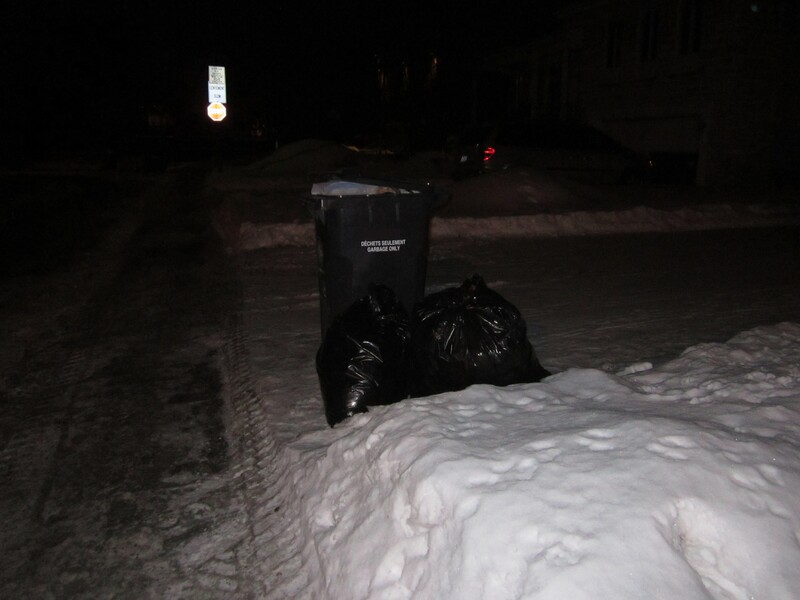 Nevertheless, the 37-year-old Malone does spend a good many of his off-hours digging through the trash. And the fact is, he earns a sizable amount of money from this activity—more per hour than he makes at his Slait job. Why would this guy give up his location? I don’t know many people who would. They would lose their livelihood. Fonda Rush, good point. Maybe he has moved on to a new town/area, or maybe there is so much “stuff” discarded that he cannot use/rescue it all. Years ago, I read (here in Canada) about someone who did something similar. He did well for a long time. then, the retailers whose garbage he was rescuing found out, and INSISTED every discard be thoroughly smashed. Sad. but sure something better, could be done. Pretty sad that the companies would destroy those things in that manner. I guess it protects them from fraud a bit, as you could take broken items from the trash and exchange them for new ones. I tend to think the liability excuse is a crock, as I can’t think of any example where I’ve heard of a store getting sued because someone went through their trash (and presumably injured themselves). 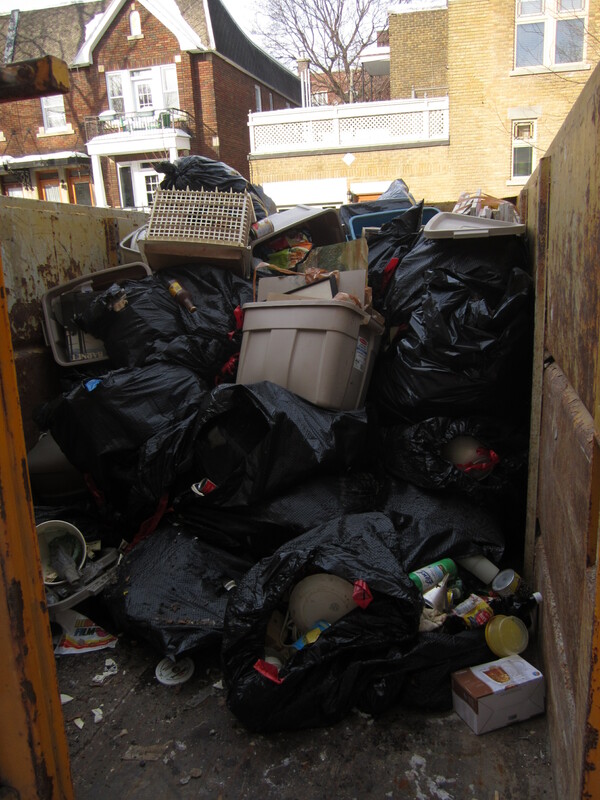 A judge would almost certainly rule in the favor of the store, as it’s clear that dumpsters aren’t made to be entered. A lot of people cite the 1994 McDonald’s hot coffee lawsuit and verdict as an example of a judge ruling against a corporation for the idiocy of an average person, however the truth is that she had very good reason to sue (and didn’t even ask for the 2.9 million awarded). The more I think of it (and the more I read other people’s reactions) the more I think this story is a bit fishy. Others have mentioned that some of the prices that he could realize seem inflated, and it seems that many stores don’t operate in this manner. I’m going to keep an eye on corporate dumpsters going forward regardless, ya never know. 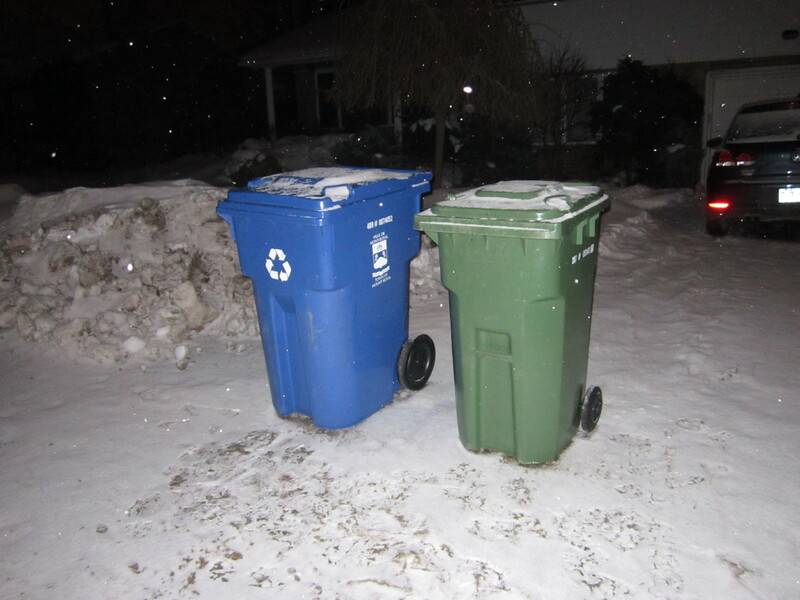 Household waste is much more interesting though, at least to me. well, from what I have seen, over many years (and just by chance), I think that quite often businesses DO chuck out lots of perfectly good items. Then the business manager (usually not the owner), can say it was damaged/write it off/not have to cope with reducing sales/irate customers etc.. Sometimes they just want to be done with it and get gone on their day off. I say managers, as it has been my observation, that actual owners are much more particular, and willing to do extra work to sell an item for “something”.. But, I have myself seen situations where both owners and managers chuck stuff out, just to be rid of the trouble, then write it down. I would be interested in the little salt shakers, too, if the previous deal falls through. I enjoy living vicariously through you. There is the neatest stuff out there to be had! The inscription on the pendant looks like it might be Arabic, not Hebrew. True, I just assumed Hebrew because of that wall hanging…. I am pretty sure the text says “Masha Allah” – thanks be to God, used to ward off the evil eye! 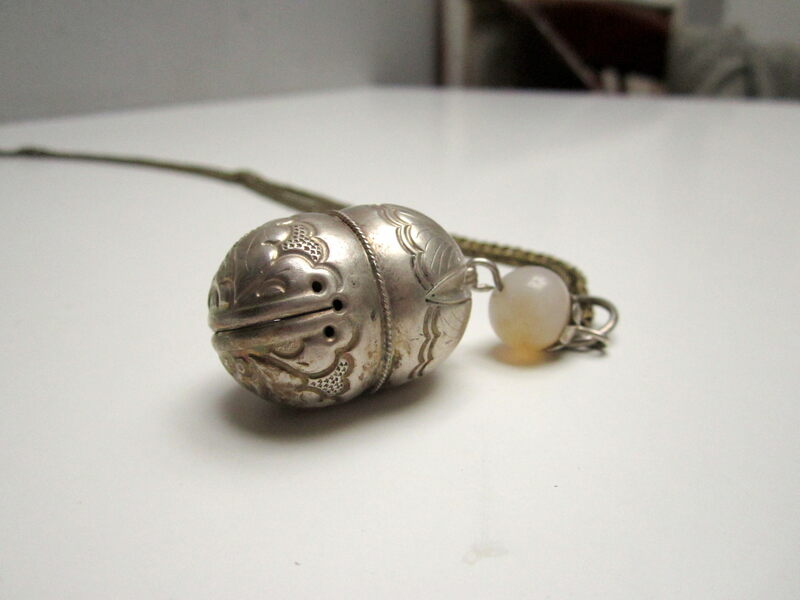 The bell is antique Chinese from the Ching or Qing Dynasty…They change the spelling alot…The bell has sound because it is a spirit bell..The sound is suppose to keep the bad spirits away….They were often just sewn on clothing. The chain is new.. Interesting, thanks. I’ll have to find out how much it’s worth! Dear Things I Find in the Garbage, Such an amazing post. It must take all day to create an entry like this. I am offering it as a bonus to my readers. Thank you! It does, this one took nearly two actually, haha. Thanks for sharing! Good article, though he should acknowledge more that his lifestyle can’t apply to the vast majority of people. I’m glad it focuses on reducing consumption, though. Dumpster diving looks to be going mainstream. good points. however, I wonder if it takes a while, and quite a few interviews/articles to figure out the best way to present one’s situation/one’s self. Even just in “regular life”, sometimes someone asks something, and then I later think, “oh I wish I would have not said that/said that/didn’t quite meant that”, etc..
sometimes I think at least some of the value in articles like that/blogs like yours, is it does get folks thinking/myself included, about the value/usefulness of items “tossed”. sometimes I think it makes one think about how to better use things/better able to imagine uses/move it on to someone who can. I love reading your posts. And I love what you do. More power to you!